Pete is a certified personal trainer, and teaches group exercise classes in various locations in the Baltimore Metropolitan Area as well as in Harford County. Pete has always looked for avenues to channel his energy. Growing up, he played a plethora of sports, including but not limited to tennis, track and field, basketball, baseball and soccer. A three-sport athlete in high school at Archbishop Curley, Pete excelled in soccer. After high school, Pete went on to play on the Division 1 Men’s Soccer Team at Towson University for four years. He graduated with a Bachelor’s degree in Sports Management. Pete’s passion is being active and staying healthy. Committed to healthy lifestyle changes, he has made a career of continuous movement through exercise and transferring his knowledge by encouraging others to do the same. Currently, Pete does in-home personal training as well as teach Boot Camp classes at True Balance Studio in downtown Baltimore and at John Hopkins Hospital Bayview. 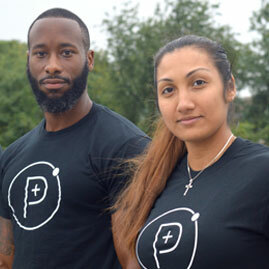 He teaches a Body Blast class and Core Cardio class at Aberdeen Proving Grounds. Pete also runs his own Boot Camp in the Bolton Hill community in Baltimore. Nikki is an AFAA certified group instructor, Personal Fitness trainer and PILOXING certified instructor since 2012. She also competed in the INBF Amateur class, Figure Fitness Competition in Stuttgart, Germany in 2013, placing 2nd. She worked in the MWR USAG Ansbach, Germany military facilities for over 2 years, bringing a positive impact to the community by giving guidance on a healthy lifestyle led them to accomplish their fitness goals. Her dedication to fitness has been a lifelong pursuit which has sparked her desire to become a certified fitness trainer/group instructor. Nikki thrives on working with and helping others to achieve their goals. Her goal is to meet each individual’s unique needs regardless of fitness level.